SAMSUNG 305V7A Battery Replacement in love-battery.com made from high quality Li-ion cells(Japan), though this Replacement SAMSUNG 305V7A Battery is not a original one, it is manufactured to meet or exceed the specifications of the original brand manufacturer, you can rest assured to purchase. Do you want your laptop run well at any mobile place ? The Follow suggestions will help you protect your laptop battery life. 1. Before using the new battery, Please read the SAMSUNG 305V7A battery maintain parts of the user manual carefully. 2. When charge your battery first time, Please fully charge 12 hours. The new battery need three times charge/discharge cycles before achieving maximum capacity. 3. If a long time (three weeks or longer) without using a laptop or find the battery charge/discharge time become shorter than before, You should fully discharg the battery before charging next time. 4. When charge the SAMSUNG 305V7A battery, Please keep the laptop power off. Don't unplugged the power on the battery charge half-way. It is best time to use your laptop after full charged 30 minz later. 5. Dont put battery exposure, damp and erosion some chemical liquids. Avoid contact with metal stuff to make battery short-circuit and so on. 1. Please recharge when power left less than 5%. Don't wait run out and then recharge. 2. Try Li-ion SAMSUNG 305V7A battery for your laptop. It can work long time than Non Li-Ion one. 3. Keep your laptop defragmentation regularly to prolong the laptop battery life. 4. Use some hard drive and optical drive spin-down software to reduce the power consumpition of laptop. 5. When long time without using laptop, Keep it in standby or sleep mode. It can both save the power and extend the SAMSUNG 305V7A notebook battery life. 6. Store your battery in a cool and dry place when don't use. 7. If you usually keep your laptop plugged in fixed power or rarely use it. Please take down your battery. If not, it will hurt the battery life. Why Buy SAMSUNG 305V7A Battery From Here? Save up to 30%, Online buying battery,you always hope get a preferential price. 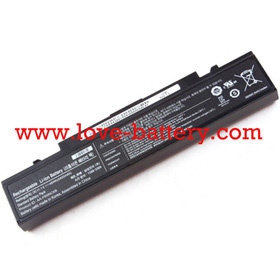 We make this sure by offering high quality but cheap SAMSUNG 305V7A Battery Replacement. We believe that our customers should receive the highest quality SAMSUNG 305V7A Replacement Battery. Our battery for SAMSUNG 305V7A passed the CE, UL, ROHS, and ISO9001 certifications. It can full charge/discharge at least 300-500 times. We have a dedicated team of customer service executives who are eager to help you save time and money by sharing their knowledge and expertise on laptop battery and related products.